Since its release last year, more than 400,000 entrepreneurs throughout the state have utilized bizfile California’s online business filing and search services, according to government data released this month. The California Secretary of State (SOS) created the online portal in an effort to bring the process of filing business documents into the digital age. The agency goal was to ensure that customers would no longer have to drive to an office and wait in line to search for business records or file financial statements. Rather, customers could simply go online, and at the click of their mouse, file or search for the documents they need. 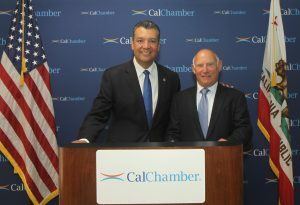 CalChamber President and CEO Allan Zaremberg (right) and Secretary of State Alex Padilla unveil Eureka Chatbot and the LLC Formation Online Submission Tool at a May 9, 2018 news conference. In May, California Chamber of Commerce President and CEO Allan Zaremberg joined Padilla at a CalChamber news conference to unveil the Limited Liability Company (LLC) Formation Online Submission Tool and Eureka Chatbot. The LLC Formation Online Submission Tool helps customers submit the documents required to form an LLC. Over the last five years, LLCs have been the fastest-growing company entity type being registered in California, with nearly 120,000 LLC Formation filings in the 2016–17 fiscal year alone, according to the Secretary of State. Since the launch of the tool, there have been an average of 308 online submissions per business day. Developed in partnership with Microsoft (a CalChamber member), the Eureka chatbot answers frequently asked business entity and trademark questions. Customers can ask a question such as “How do I get a copy of a filed document?” and Eureka will link them to the California Business Search website where they can look up their business record and access documents for free. Eureka responds best to short questions or keywords. Since May, Eureka Chatbot has already answered more than 9,000 questions. For more information or to take advantage of the services above, visit the bizfile California website.